Offering much more than the traditional variety, this set of four LockJaw self-adjusting locking clamps are perfect for getting the job done. Versatile and easy to use, the clamps are great for any number of jobs, and the patented LockJaw locking mechanism means the jaws open and adjust automatically to any size object. The one-handed operation makes them easier to use, whether you’re grabbing something thick or thin. 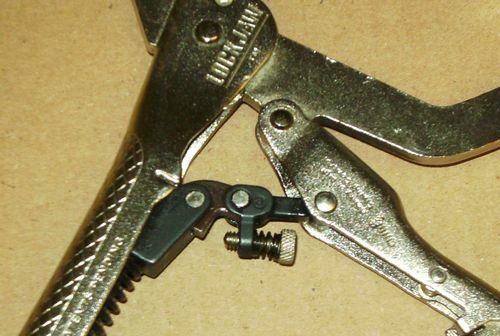 The picture showed clamps similar to the one supplied with my Kreg Pocket Hole system, but I was intrigued by the self-adjusting system which claimed to obviate the fiddling about needed with the Kreg clamp or a Mole grip. They were being offered by QVC, a shopping channel not immediately associated with top quality tools, but the price including p/p was £26.03 – so I sent for a set. 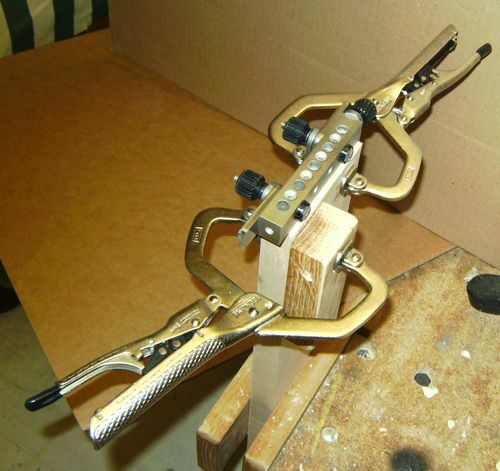 The clamps DO work in the manner described, with the chosen pressure (or at least the force required to close the clamp) being the same for varying thickness of clamped material. In the picture below, the force to close the lower clamp holding the leg of the Joint Genie was the same whether or not the extra wooden spacer was added. I appreciate that the QVC ad appeared because I am in the UK, and I have no idea whether the clamps are available elsewhere, but for me, they do look as though they will be very useful – particularly with the Joint Genie. I could not find any reference to an earlier Review of these clamps, but if I missed it, my apologies for the repeat. I have awarded only 4 stars, as one of the springs that control the ‘floating’ jaw was not correctly fitted. The clamp appears to have been designed so that the spring cannot fall off in use, but that prevented me getting it back – even tho’ as I previously worked for a company that made small springs, I consider that I have some expertise in this area (LOL). I will return the offending item using the included QVC returns details, so I expect it will be replaced without any problem. Hey thanks for the review. As a long time farmer/mechanical hack, i have always wondered how those types of vise grips work. I just never felt the need to get some different than what I know. Thanks for the info. I might have to try them some day. Thanks for the review. I did not know that the amount of pressure could be adjusted on those. I might give them a try. As a follow-up to the 4-star rating because one of the clamps had a spring misplaced, I did return the single offending item to QVC, and they DID send me a replacement – but a complete new set of 4 clamps! So I now have 7 ! If I could amend the original rating, I should perhaps award 6 stars !!! !